© 2007 Estate of Pablo Picasso / Artists Rights Society (ARS), New York. The original painting is at the Museum of Modern Art, New York. This image was copied from Wikipedia. 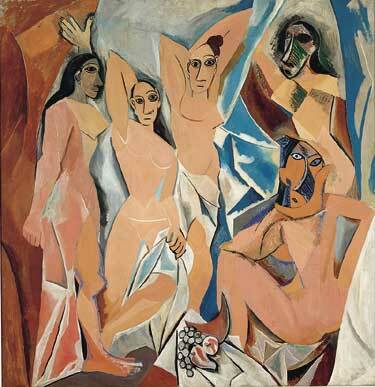 Pablo Picasso finished painting Les Demoiselles d'Avignon one hundred years ago this month. Les Demoiselles is the tipping point between old and new art. There have been some tipping points since, but none as important. This post is a celebration of that moment.